If you have always wanted to live in a farmhouse, with your own chicken, cows and fields, but couldn't because prices range from Rs 20 crore to over Rs 100 crore, there is hope for you. The Delhi Development Authority, or DDA, has decided to reduce the minimum area required for a farmhouse from 2.5 acres to 1 acre. In one stroke, farmhouses have become affordable to a bigger section of Delhi's population. Property dealers and consultants say they are inundated with queries from buyers. PropEquity, the real estate data analytics firm, is toying with the idea of setting up a special fund for farmhouse projects in the city. "It is a wonderful opportunity," says PropEquity CEO Samir Jasuja. Actually, investors had expected such a policy change for the last three years. Aware that such a decision would trigger a huge demand for farmhouses, they bought land, which could be developed into farmhouses, in Delhi in large swathes. As a result, prices more than doubled in the last two to three years in areas that have a high concentration of farmhouses and good infrastructure: Chhattarpur, Rajokri, Bijwasan et cetera. 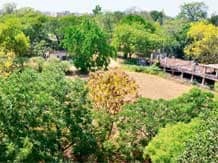 At the moment, land for a farmhouse can cost around Rs 20 crore an acre in Rajokri (residents include Malvinder Mohan Singh and Arun Bharatram) and Rs 40 crore an acre in Westend Greens (Sidhharth Shriram stays here). These farmhouses can now be cut into smaller plots and sold to buyers. The scramble for land took place in many villages within Delhi where not one farmhouse exists. (All told, there are over 250 villages in Delhi.) DDA had said that it would identify some villages on the "green belt" as "low-density residential areas" for the development of farmhouses. Or else, it was argued, that these villages would become slum clusters, ghettoes or unorganised colonies (à la Sainik Farms). This meant that DDA would develop the infrastructure and provide the civic amenities. So, hectic jockeying was done by various investors who had taken positions in different villages - include this, exclude that. DDA started with a list of 32 villages, brought it down to 27 and has finally shortlisted 26. While most of these 26 villages are in the southern stretches of Delhi, there are some (Bakoli, Bakhtawarpur and Hiranki) in the northwest and some (Paprawat, Ghuman Hera and Jhatkara) near Najafgarh. Most observers feel it could take another three or four years for the infrastructure to come up. The development of social infrastructure, like hospitals, clubhouses and schools, could take longer, perhaps even up to 10 years. In some of the villages, like Satbari, Asola and Chhattarpur in south Delhi, the infrastructure is already in place and hence the new policy could take effect soon. In some of the 26 villages, you could still strike a bargain for around Rs 2 crore an acre, though prices here too have climbed sharply, in some cases as much as 100 per cent, in the last one year. In some villages, prices have shot up to even Rs 7-8 crore an acre. Developers have bought up to 50 acres which can be developed as a gated community of farmhouses. (With rising security concerns, gated communities have gained immense popularity in and around Delhi.) Observers say that large chunks of black money could have been invested here because the circle rates (official prices) are still way below the market rates. With the new supply coming in, the rate of increase in farmhouse prices will get arrested, though nobody expects prices to fall. "There is no logic to land prices in Delhi and Mumbai," says Anshuman Magazine, chairman & managing director of CBRE, the world's largest real estate consulting firm, for the South Asia region. So what's the cost of building a farmhouse? An acre in the villages near Najafgarh costs around Rs 5 crore. DDA has now allowed owners to construct houses on up to 20 per cent of the land, as compared to 15 per cent earlier. This would mean a floor area of almost 9,000 square feet. At Rs 3,000 per square foot, the construction cost would come to Rs 2.7 crore. This means the cost of land and farmhouse comes to Rs 7.7 crore. This is not very different from independent bungalows being built by developers in Gurgaon. Of course, it works out substantially cheaper than some of the top-end apartments in the suburb. Investors expect the value to rise rapidly with the Delhi Metro line close by and a 100-metre-wide road being planned to connect the villages. The investment of Rs 7-8 crore could become Rs 40 crore in five to six years, they insist, which is the going rate for farmhouses in the similarly-located Pushpanjali Farms area close to Gurgaon. This explains the scramble for land in these villages in recent months. The rush for farmhouses has dented property prices in the private residential colonies in south Delhi. According to property dealers, prices have crashed by as much as 25 per cent in the last one year. People who could have bought a builder's flat in south Delhi colonies like Greater Kailash, Green Park, Chittaranjan Park and Saket now realise that they can get a farmhouse with the same money. Most analysts expect the slide in south Delhi property prices to continue for some more time. "It will be in pain for at least another 12 to 18 months," says Anckur Srivasttava, chairman of GenReal Property Advisers. However, the Lutyens Zone of central Delhi hasn't been impacted at all by the farmhouse phenomenon. That's perhaps because the people who stay here are not the ones who invest in farmhouses - for them, it is important to live with the power elite of the country; nothing else matters. There could be one spoiler. It is learnt that Haryana is working on a similar farmhouse policy for green belts outside urban limits. The state, informed sources say, has almost finalised the policy. In fact, it does better than the DDA policy because it allows developers with, say, 100 acres to develop a whole township of one-acre farmhouses. This takes care of the three big concerns of water, electricity and security, and could therefore draw investors from Delhi to the neighbouring areas in Haryana. As it is, the state has allowed owners of special economic zones that fall beyond urban areas to develop 15 per cent of their land for residential purposes. That could roil the market for Delhi farmhouses. Is there a rival lobby of builders and developers at work? Your guess is as good as ours.